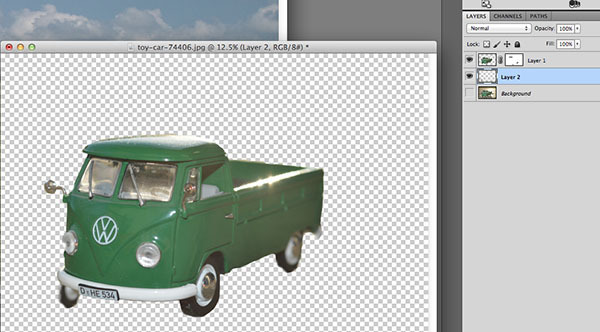 The CoffeeShop Blog: CoffeeShop Paint-By-Number Photoshop/PSE Action and Tutorial! CoffeeShop Paint-By-Number Photoshop/PSE Action and Tutorial! Today I am going to show you a really fun technique to create custom digital paintings using my CoffeeShop Paint-by-Number action and free stock photos from Pixabay. 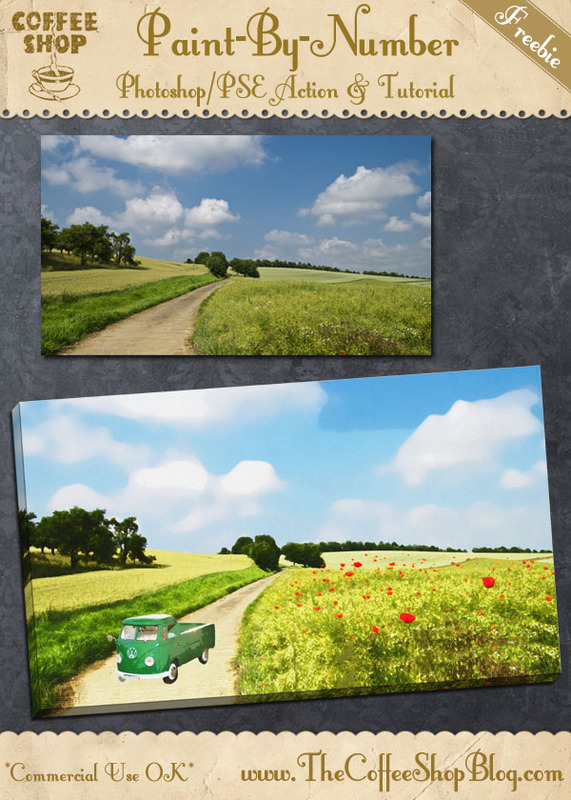 I also found a really neat free gallery-wrap action that you can use to finish the effect. I have to confess that sometimes I really want to do something different in Photoshop/PSE, and this type of technique is fun and addictive! I have a fascination with old paint-by-number paintings. They are quite popular now and hard to find. So I decided I wanted to write an action to make a digital version that I can have printed on canvas at ColorInc. I googled to find some tutorials, and I only found one really good one. I read through the tutorial, played around with edit, and wrote my own custom paint-by-number action. Open your image. 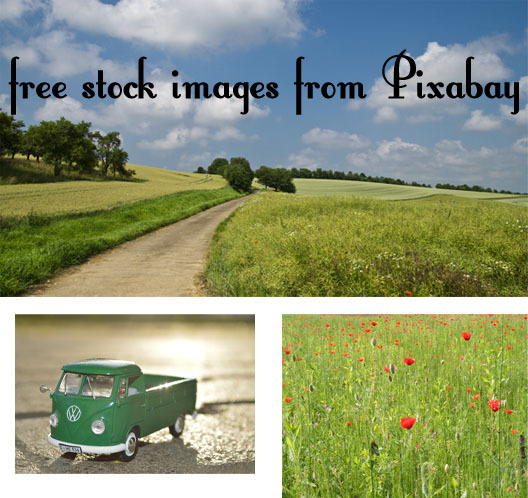 This free stock photo from Pixabay is perfect because it has a wide range of colors. Start the action. 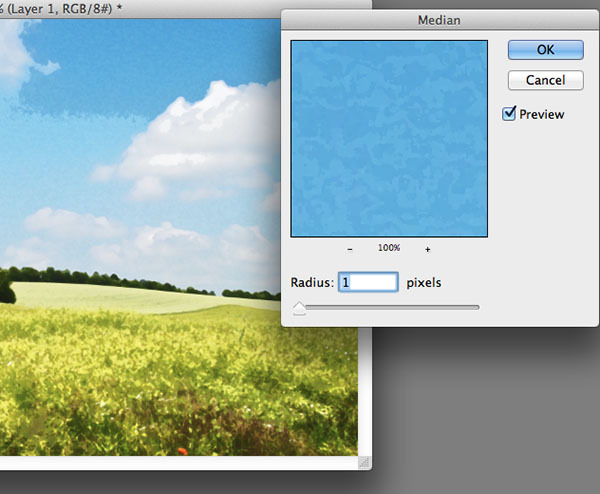 I usually keep the Median filter at the preset setting of 10 but I go as high as 20. Adjust the levels to add contrast to your image where needed. This action can really pixelate skies, so when the Median filter prompt comes up again, slide the radius up to remove all artifacts. Don't worry about softening the rest of the image, you will be able to paint this effect where needed. I moved the radius up to 48, and you can see everything is blurred but the sky looks great. When the action is finished you will have three layers. Paint on the second layer with a soft white brush at 100% to smooth out skies and other areas that look rough. 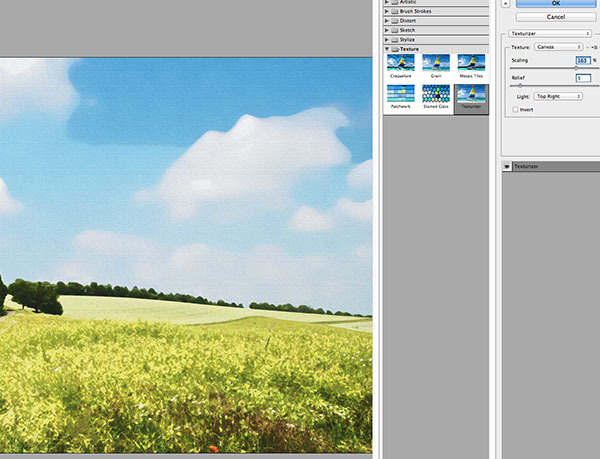 After painting on the second layer, you can see my sky is very smooth. 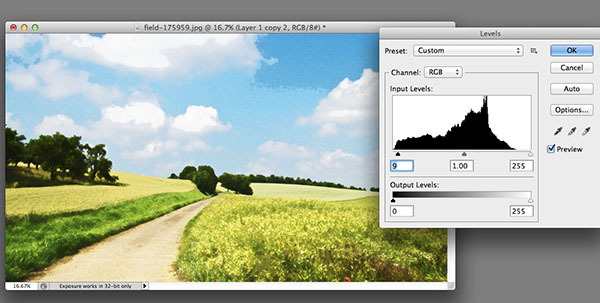 You can also go one step further and use add a canvas texture to your image. Flatten the image and go to Filter, Texture, Texturizer and adjust your settings to taste. I really wanted to make this painting my own, so I went ahead and added some additional design elements before running the action. 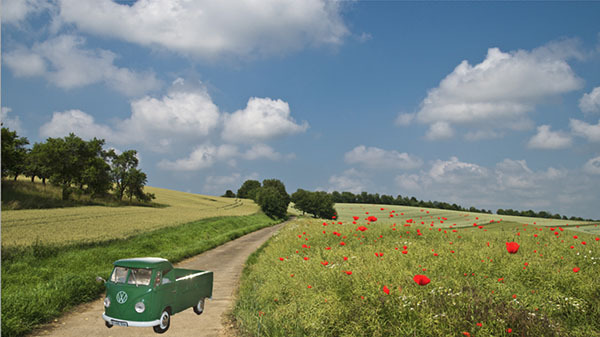 I found this adorable toy vintage car and field of flowers on Pixabay. I cut-out the car using the lasso and removed all of the background. Then I dragged the car on my original image and added a levels layer to adjust contrast. 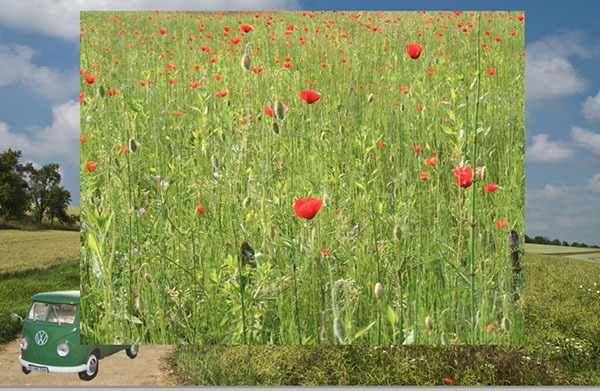 Then I dragged on this wildflower photo and free-transformed it to fit on the field on the right. 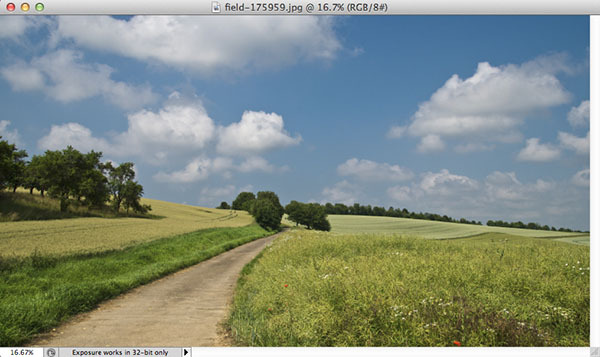 Use a layer mask to remove any from the road and horizon. Then I selected the red flowers using my magic wand (Photoshop users can Select, Color Range) and copied (Ctrl-J) them to a new layer. I turned off the original wildflower layer and added a levels adjustment to the flowers and adjusted the contrast. Now my truck and field look great and I am ready for the action. NOTE: I didn't worry about scale on this edit because I wanted it to look surreal and almost child-like. I ran the CoffeeShop Paint-By-Number action and finished the image off for the web by applying a free gallery-wrap action (this action adds a canvas texture automatically). When you use this action make sure you don't have anything important on the edges of your photo or it will look warped. Here is my finished edit! This isn't something you will do all of the time, but it is really so fun and creative. 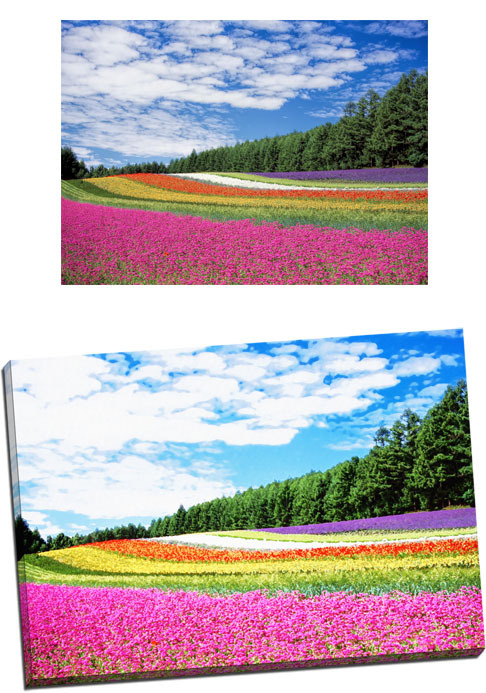 I think this would be a great type of edit to make and print actual canvases for your house. 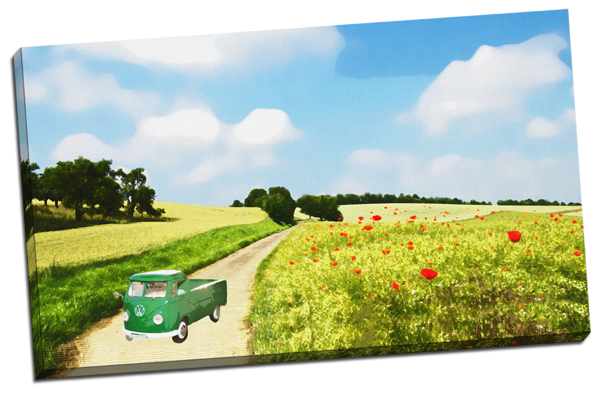 You could turn your own photos into paintings that are vibrant and fun. I hope you have as much fun as I have doing your own paint-by-number edits! Download the free CoffeeShop Paint-by-Number Photoshop/PSE action. You can also download it here.